At Febooti Software we strive to always satisfy your needs. 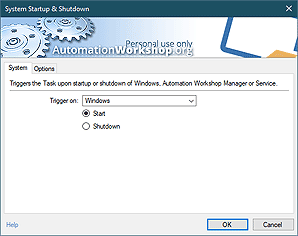 Close cooperation with our customers has allowed for numerous improvements of Automation Workshop software products and related services, finally resulting in releasing Automation Workshop Free Edition, the freeware version of known IT process automation solution for Windows. Our ability to distribute and improve our automation software highly depends on contributions of our users. Learn how you can help us! How can I contribute to development of Automation Workshop Free Edition? Place a link to Automation Workshop Free Edition on your website or blog. Tell your friends, coworkers and community about our free automation software on IT forums and popular social media websites. You can also help us financially by purchasing Personal Use or Commercial license. Are there more options to contribute to development of Automation Workshop? Yes, you can always request features that you need or provide your opinion on our software. We are glad to get feedback from users on the features and usability of our software as well as any other relevant aspect of IT automation that involves Automation Workshop. Where can I get help on using Automation Workshop freeware version? Use the Documentation to learn about the features of Automation Workshop Free Edition. Also, you can find a comprehensive knowledge base with relevant articles, tutorials and help pages on the website of commercial version of Automation Workshop. How can I recommend Automation Workshop Free Edition to others? It is easy! Choose your favorite social media website and click the respective icon in the page footer. You can share the information about our free IT process automation software on Facebook and Twitter. Alternatively, feel free to place a link to our website on your blog, website or favorite forum. Take a moment to share our software with your friends and colleagues. Share · tell about our free software on your favorite social media. Spread the Word · see how you can help us. Thanks for your time! We hope Automation Workshop will save some time for you in return. Automation Workshop is ease to use, and the power under the hood is brilliant! —Barbara G.